Glossy Glamping came across TinyWoodHomes a few days ago, and lost no time in asking the company owner to tell us more about these delightful wooden structures that are perfect for glamping! A spare corner of a field could be the key to extending the family farming business and providing additional income. Having made the decision to set up a Glamping business to compliment existing holiday barn conversions on the Farm, Aidan Reeve then set up a company called TinyWoodHomes to design and manufacture a new style of Glamping unit. TinyWoodHomes has a proven concept for miniature holiday homes that are unique within the British Glamping Industry. Inspired by a desire to create petite architecture, each Tiny Wooden House offers all the comforts, proportions and appointments of a two bedroom house, all within a truly tiny footprint. TWH has pioneered a new dimension to the glamping market, a notion that luxurious and comfortable living can be brought to the campsite, which will attract a high rental premium from a new demographic of discerning customer, all within a a realistic budget for the owner. Tiny wooden houses are designed to be fully portable, and comply with the dimensional definition of a caravan, thus do not require Full Planning permission. TWH design and finish each unit to your own bespoke specification and budget. 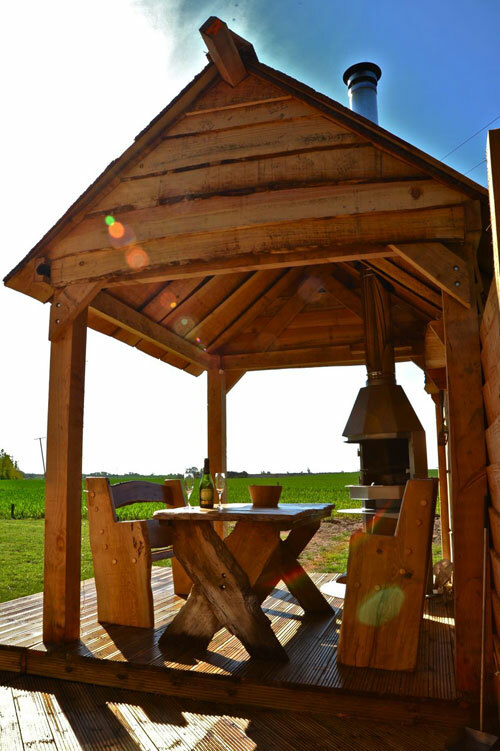 Accompany your Tiny Wooden Home with a wood fired hot tub and/or Wooden Gazebo with Wood Oven to create an all inclusive and very much exclusive holiday unit. Visitors will be amazed to find a well appointed kitchen finished with granite worktops, a fold away dining table that seats five, a living room with wood burner and two sofa beds, separate shower and toilet and two staircases leading to the bedrooms and the Hot Tub…. all on the ground floor! At one end of the living area a spiral staircase leads to a landing from which guests can access the Hot Tub via a doorway, or access the Master Sleeping Loft with King Size double bed. At the opposite end of the living area a fold down staircase leads to a landing that provides access to a second sleeping loft with three single beds. Adjacent to the landing is doorway into Shower, WC and basin with private changing area. The House sleeps 5 + 3. The Twin Sofa Bed is used to make the extra two beds. Two small singles or one 3/4 double and a single sofa bed pulls out to make another single. The company also offer various add ons, such as a South African styled Gazebo (or stoep) which features an indoor wood fired BBQ (or Braai) which doubles up as an open wood burner. As evening temperatures dip, extend the day by sitting alongside the roaring fire. Who doesn’t love a hottub? 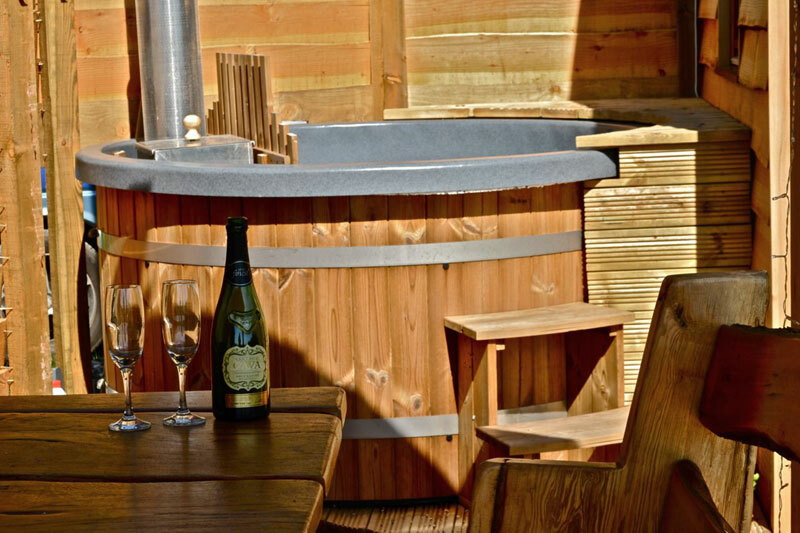 The Wood Fired Hot Tub provides solace whatever the weather. The warm steaming water and crackling log fire are attractive come rain or shine, summer or winter. The upstairs sleeping loft has two single beds not three. The single sofa bed is omitted. The bathroom is smaller and the changing area is created with a privacy curtain. The living area is slightly smaller. Tiny wooden homes are built on a modular chassis which are liftable by crane. The chassis can be supplied with drawer bar assembly and wheels suitable for movement around the campsite. The chassis can also be extended so the Hottub fits on the drawer bar and the entire unit moves as one. This means the homes can be readily moved off site by a 4×4 at the end of the season to comply with Planning restrictions, or simply for security. The Homes are Compliant with Certified Site rules that state that Glamping pods must be moved every 28 days. The example shown costs £35k + VAT, which means you can almost recoup this cost within your first year (based on a 80% occupancy with an average week costing £780), making these little houses even more attractive!